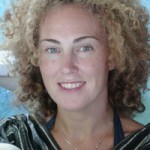 Amy Ippoliti is passionate about Advanced Yoga Teacher Training. Meet Amy Ippoliti—yoga teacher, author, earth activist and founder of 90 Monkeys, an online professional development school for yoga teachers. One of the first things I noticed when I watched this video interview with Amy was her irrepressible enthusiasm for the practice of yoga. Yes, there’s no doubt in my mind that this woman loves yoga, and loves sharing it with the world. And yet, while Amy is incredibly open hearted and enthusiastic, she also cultivates a sharp and critical mind. She pays attention, she asks tough questions and she calls on us to examine our unexplored assumptions about how we teach and practice yoga. For example, although 60-minute yoga classes are popular and convenient are they really serving us? Or are they watering down the fullness of the potential of yoga? These qualities of an open heart and a tough mind combine in Amy’s passion for quality ongoing education for yoga teachers, and—lucky us!—she’s bringing some of her Advanced Yoga Teacher Trainings to New Zealand in 2017. Yoga for Humans: How to Teach and Adjust Students with Tight Bodies and Injuries will be taught in Auckland at the end of September, and Hands-On Assists is coming to Wellington in early October. Yoga for Humans: How to Teach and Adjust Students with Tight Bodies and Injuries, 28th September – 1st October at Om Yoga Studio, Auckland. This dynamic and intimate 4-day training is dedicated to learning how to serve students with challenges and special needs in the company of other high-level yoga teachers under Amy’s caring eye. This training gives you the tools to stand out as a teacher who can speak to many populations, effectively address student’s physical limitations, provide compassionate solutions for students with injuries, and teach full group classes as well as private sessions with more empathy, expert skill, and confidence. Find out more here. Join Amy Ippoliti for an intimate, advanced teacher training that focuses on Hands-on Assists. In this training, you’ll learn how to give masterful hands-on assists that are both educational and empowering for your students and discover the art of service and attention through refining and practising your therapeutic touch under Amy’s watchful eye. Find out more here. First of all, i loved this article, its comprehensive and lets you know everything about a 60 minute practice, and it is all so true. With this comment, i would also like to take the opportunity to let you guys know about this event that I’m headed to in October. It’s the International Yoga Festival, being held in Mysore, Karnataka, and i was hoping to meet you and maybe your protégés could also join the festival. It’s going to be amazing.